Here is her picture for this Friday. And my story. I didn’t always look like this—sagging, aged, yellowed, and sad. In my youth, I was wanted, needed in fact. The first purples and pinks in the swirling autumn skies signaled the arrival of dawn, of a new day fresh with knowledge. Laughing children would run to my door. Excited to learn, they’d push their way into my one room; sit at wooden desks, surrounded in scent of quill, parchment, and caulk.The black board against my side offered up sums and letters. Primers in worn jackets whisked their young minds into a world of poetry and prose. My time is over now. Obsolete. But do not weep for me. This entry was posted in Friday Fictioneers, knowledge, learning, Madison Woods, R.H.Burkett, Ruth Burkett Weeks. Bookmark the permalink. That's great, Ruth. I love it. I may have to become a flasher myself. 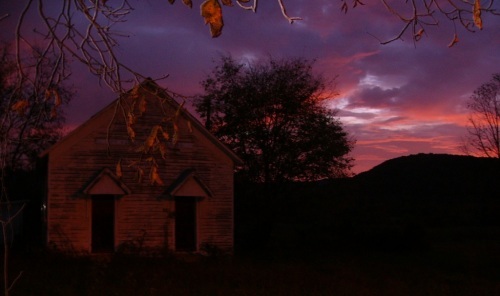 I love the picture–the purple behind the schoolhouse is breathtaking. Enjoyed your flash fiction. I've always worked nights and never witnessed a purple-hued sunrise (of course, I didn't see ANY sunrises for the most part. :-)) You did a good job of "personalizing" the school.